Mixture of perennial and self-sowing annuals in a Maxi-Pack. 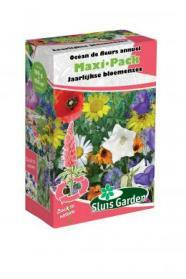 This specially composed mixture contains perennial, but also some self-sowing annuals. You will be pleased to have your yearly flowergarden with this nice and interesting mixture. Extra sowing in the year following is advised, as this will of course improve the diversity of the flowers. Contains: Achillea, Campanula, Centaurea, Chrysanthemum, Coreopsis, Gaillardia, Gypsophila, Hesperis, Liatris, Linum, Lupinus, Lychnis, Oenothera, Papaver, Rudbeckia, Salvia etc.